If you couldn't tell by the fact that I have a whole blog dedicated to them, I love books. The homes in which I grew up were always filled to the gills with books: my parents' old physics textbooks from college sat next to stacks of trade paperbacks by Heinlein, L'amour, and McCaffrey on massive shelves my father custom-made to hold all of the books the military moved for us every three years. I remember my dad's set of the ancient Tom Swift series on the very top shelf, out of reach of sticky little fingers, and the entire Encyclopedia Britannica (before the invention of the internet I did so many homework assignments with those) on the bottom shelf where we curious kids could find our own answers to all the "why"s we asked our mom. Books have always made a place feel like home to me. 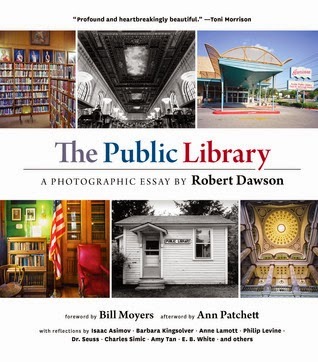 Maybe that's why I had an inexplicable case of what I can only describe as homesickness flipping through Robert Dawson's magnificent photographs of public libraries across the United States that I have never personally visited. From the tiny Rudy's Library in Monowi, Nebraska (population: 1), to the soaring and light-filled Central Library in Seattle, each library had appeal and spoke to the character and needs of its community. It's hard to talk about public libraries without mentioning Andrew Carnegie, who donated the money to build more than 2500 libraries across the country between 1883 and 1929, including ones pictured in this book in New York; Santa Monica, California; and the first Carnegie library in Braddock, Pennsylvania. But no less community-minded than he, the eight women of the Priscilla Embroidery Club in Roscoe, South Dakota, saw a need in their little town in 1932 and organized donations and volunteer labor to build a 12' x 14' building to serve as a library, keeping it open for 70 years before they could no longer maintain it. The Public Library includes essays from brilliant writers - Amy Tan, Barbara Kingsolver, Anne Lamott - letters to kids from Isaac Asimov and Dr. Seuss, and stories about the difference libraries have made and continue to make in people's lives. I was touched by Kelvin K. Selders, the librarian for the Northeastern Nevada Regional Bookmobile, who drives hundreds of miles to some of the most remote locations in the continental United States to ensure the everyone has access to books. He describes growing up in poverty and knowing that "the most essential aspect of my work is getting the books into young hands." I often see patrons waiting for me when I get there, and when the steps are locked and the generator is started, the schoolkids come out. Have you ever seen a child running to get a book? I have, and it makes me feel my job is worth more than the money I make. I seriously got a little teary re-reading and typing that. Chip Ward, a former assistant director of the Salt Lake City Public Library, writes about the importance of libraries to a democratic society. We enjoy a democratic culture--not because we are like-minded, but because we realize that although we are not like-minded, we have common interests and needs that trump our disagreements...A library is a place where dissent is respected, tolerance is show, and open-minded behaviors are modeled. He also discusses the intricate and delicate relationship between public libraries and the homeless. The belief that we are responsible for each other's social, economic, and political well-being, that we will care for our weakest members compassionately, should be the keystone in the moral architecture of a democratic culture. It is not enough to say it. In the public library we try to do it by creating a respectful and inclusive environment where we can practice that complex and crucial dance of mutuality that is only possible in a safe and open civic commons. It's a rare week when I don't stop by the library at least once, to pick up a book I've requested, to drop off a book that's due, (rarely) to pay an overdue fine, to have a few quiet minutes to read in a comfy chair or get some writing done while waiting for my son's preschool to get out. I've taken all three of my boys to story time, found books to help them with their homework or to learn about something that interests them. Most of the books I read for this blog I get from my library. My life would be immeasurably poorer without access to libraries. I can't improve on the final words of the afterword by Ann Patchett. If you love your library, use your library. Support libraries in your words and deeds...Make sure that in your good fortune you remember to support [others'] quest for a better life. That's what a library promises us, after all: a better life. And that's what libraries have delivered. My friend, Paul Rodkey, is fond of saying that, "The most dangerous building in any town is the library, because that's where the ideas are!" And unfettered access to the ideas, as well.